The DV8 Pitbull Bark is a high performance ball that is aggressive on the oilest of conditions. 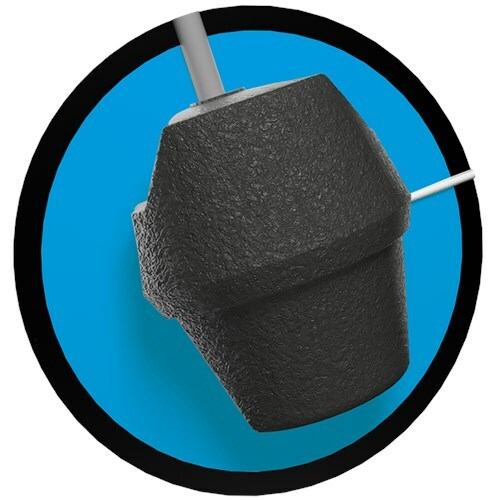 DV8 combines their Composite Fang Max coverstock with lower RG and high differential asymmetric Pitbull core to produce the Pitbull Bark bowling ball. This ball is finished with a 1000 grit pad and offers max hook even when faced with the heaviest oil conditions. When you need maximum hook on really heavy oil conditions make sure you have a Pitbull Bark in your bag. This is the first ball in the DV8 line to utilize the proven DynamiCore. Similar Balls: Same Hook Potential, Lane Conditions & Coverstock as the DV8 Pitbull Bark. Dynamicore need i say much more!!!!! I used this on many different shots and on medium to less oil i could get let and let the ball read and never seemed to lose carry. on heavier oil the ball would get down lane smooth and once it saw friction made the turn to the pocket but was not to archy and really made the pins dance with That Dynamicore! This ball hits like a truck. It's my go to ball with medium to heavy oil. I have been waiting for a release like this that would include a Dynamicore version of one of my most favorite ball editions of the DV8 brand. 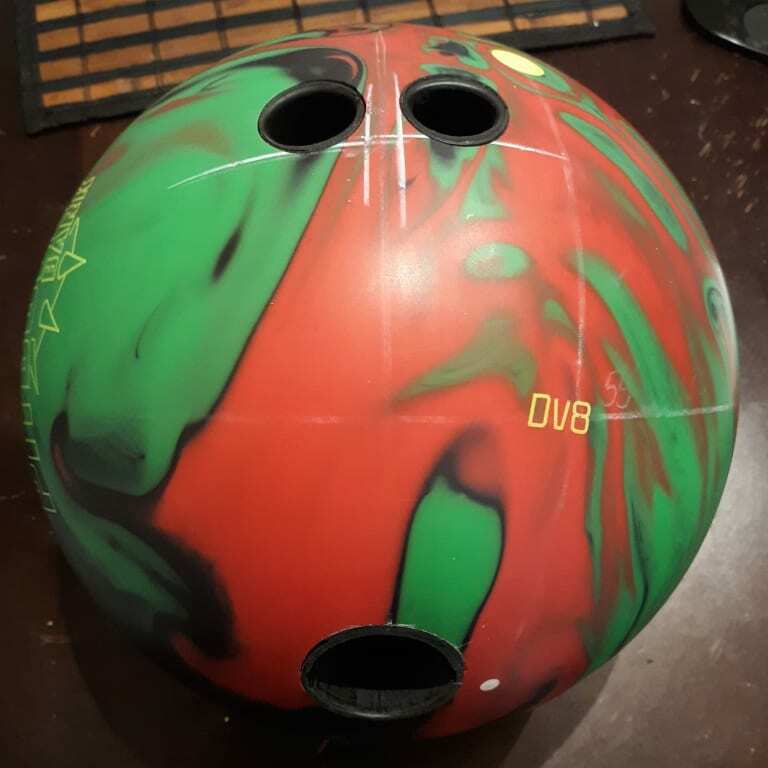 This ball goes a bit longer than the Bite release, hits just as hard, just as clean, and can cover more boards as it makes it way to the pocket, and the added Dynamicore gives you more pin action as of the Kingpin releases from Brunswick. This release performs great from any cover surface you want to modify it to, and you will be able to keep it in play in league with the right layout and cover match, which for me was a slight bit difficult with the Bite release because it was a earlier hooking coverstock. I am a fan favorite of the Pitbull releases, and the Bark is now my most favorite to date. Here is the latest addition to the Pitbull line, the Pitbull Bark. This ball features the same core as the other Pitbull but is wrapped with the same cover base featured in the bite but the added some additive to create the Composite Fang Max. The cover provides more down lane reaction to the ball. Another terrific addition to the DV8 line is dynamicore. The Bark is the first ever DV8 to provide that technology. So you can get more carry out of the ball! I punched this ball with a 45 x 3" x 70 layout. Usually I tend to put more weak layouts on the stronger ball to avoid the ball to burn up too fast but for this one I decided to get the max out of it. On the lane, this ball is a monster. This ball hooks a ton. I was surprise that the ball doesn't burn up even with stronger layout. I was even more surprised to see so much continuation I can get in the pins. Compared to the Bite, I needed to move to boards left with my feet and one with me eyes because the ball is so much stronger on the backend. When I switched to the Poison, I had to move two boards right with my feet and 1 with my eyes to be able to get to the pocket. The Bark offers earlier roll, so I can cross more boards. When I compared the ball with a pearl one, I had to move four boards right with my feet and two with my eyes to be able to hit the pocket with the Hitman Enforcer. I know, those two balls are not in the same ballpark, but I wanted to compare it with something pearl! The ball comes with a 1000 grit finish on it but don't be afraid to adjust the surface because this cover is versatile. For the speed dominants like myself, some surface can be added. I played a tournament with a 500 grit on it and the ball was still not burning up. For people with less speed, you can adjust the cover to 2000 or 3000 grits to get more length. You can even put some polish on the ball if you want it more flippy and this ball looks really nice with some polish on it ??. Will this be a good ball for the national bowling tournament. Yes, this could work well in the national tournament if the lanes are very oily. This is ideal for heavier oil so it will not work in the later games as well because it needs more oil to work correctly. How often should the ball be cleaned and what ball cleaner is recommended for this ball? You can clean it after every game if you'd like. Any cleaner would work just fine for your bowling ball. RG stands for rotation of gyration. 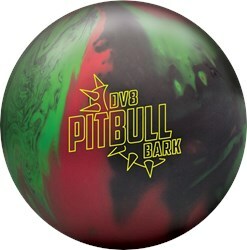 Due to the time it takes to produce the DV8 Pitbull Bark ball it will ship in immediately. We cannot ship this ball outside the United States.